The shops of retailer John Menzies were, in terms of stock, very similar to those of WH Smith. Books, magazines, comics, records and stationery filled the shelves in outlets of both companies. 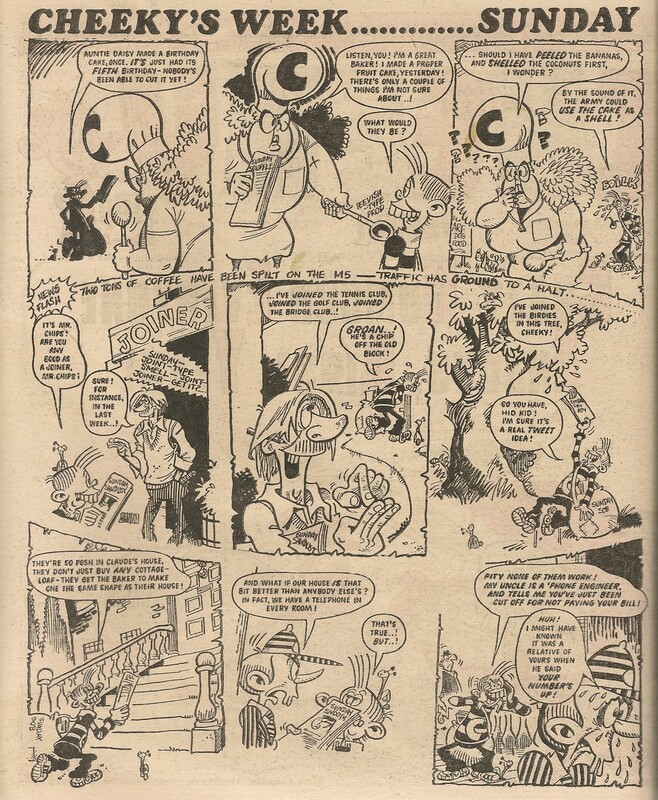 WH Smith placed 11 adverts in the pages of Cheeky Weekly, only one of which featured in two issues. 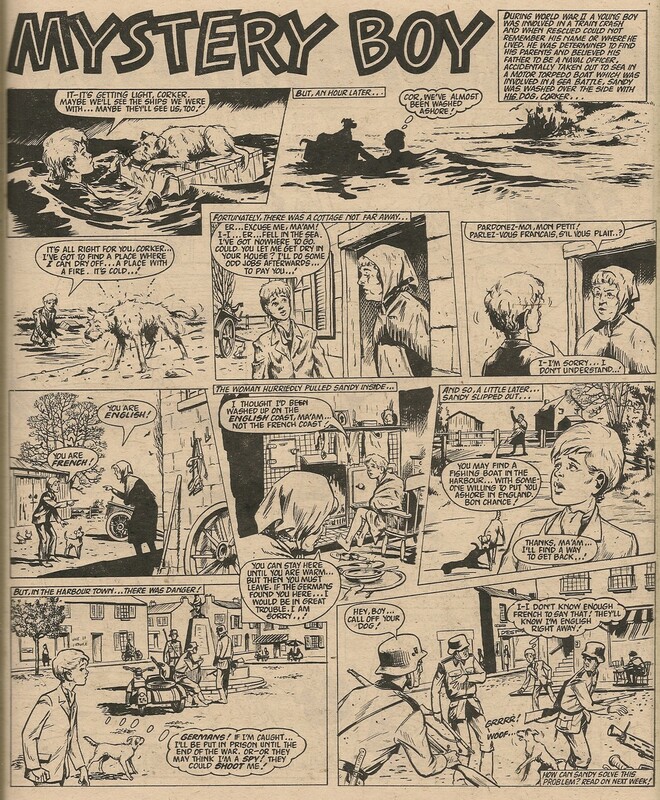 John Menzies placed two ads in the toothy funster's comic, both of which were the same. 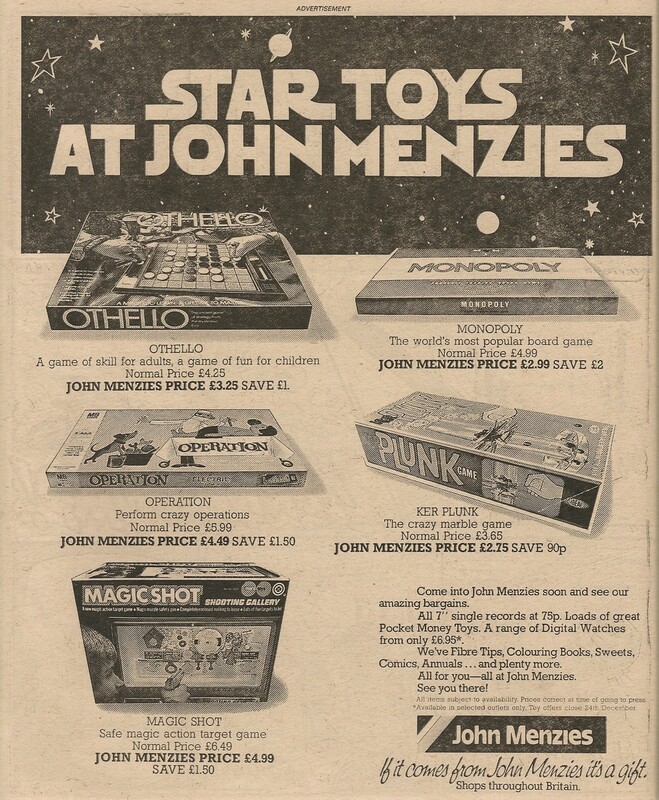 The above ad appeared in the run-up to Christmas 1978 (issues dated 18 and 25 November), and a glance at the banner would suggest Menzies were promoting toys linked to the Star Wars phenomenon which had developed since the first film made its UK debut a year earlier. 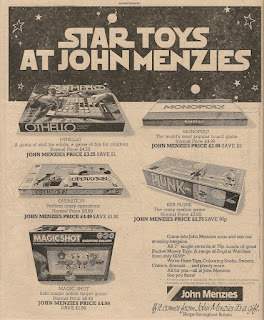 However, there's not a Vader, Skywalker or droid to be seen - the ad promotes a selection of boxed games. Pursuits of this type would be usurped by the silicon-chipped gadgetry proliferating in homes across the country before too long. The highly inflationary economy of the late 70s meant that retailers often included small print intimating that prospective purchasers may like to pack some extra cash before venturing out, as the prices shown may no longer apply by the time they got to the shops. WH Smith did the same in their Cheeky Weekly ads. The Scottish name Menzies is, I understand, often pronounced 'mingiss' by those north of the border. Most people in the London area pronounced the name to rhyme with 'frenzies'. The company provides their own pronunciation guide here. Debate on the high street over how the name should be spoken became somewhat irrelevant after John Menzies' retail outlets were bought by WH Smith (wisely choosing a name over whose enunciation there was little dispute) in 1998. Menzies continue to operate distribution and aviation businesses. Three weeks after the toothy funster staged a seaside raid on Sid and his serpentine sidekick, other Cheeky Weekly alumni were involved in raiding activities, and this time there was an immediate retaliatory strike. In the above story, clearly written in response to public concern over the high rate of birthday cake thefts in the late 1970s, Odd-Ball cunningly avoided a nasty surprise from Charlie's bicycle pump by arriving at the party pre-inflated. Yes, plucky Charlie refused to be cowed by the unbidden intrusion of the alien sphere, and in a retaliation to make all friends of Cheeky proud, he took the fight right to the heart of Whizz-kid territory. 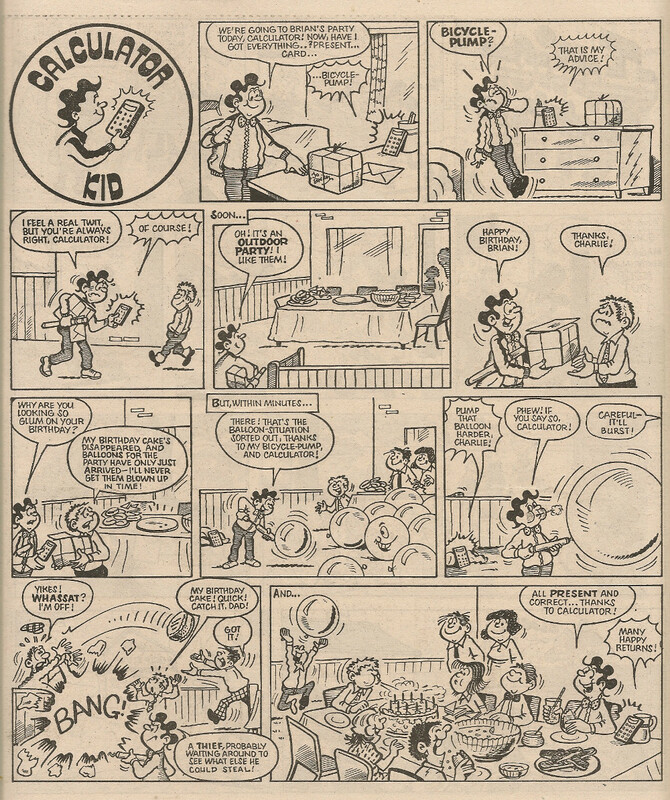 There's obviously some sort of feud developing between Calculator Kid and Odd-Ball, as Charlie and his electronic chum raided the rubbery red rascal in the 18 May 1985 issue, while this week's is the second raid Odd-Ball has carried out on Charlie and Calc. This is also the second time that erstwhile Cheeky Weekly stars have suffered and perpetrated raids in a single W&C issue (although it is the first time the same star has been the instigator and victim in a single edition). The latest double raid brings the total incursions carried out by ex-Cheeky folk to 5, while the Whizz-kids have notched up 8. Watch out for the next raid soon! I've commented several times in the past when 6 Million Dollar Gran has been described as bionic within the pages of our favourite comic despite it being clearly established in the first issue that she's a robot. Well, it's happened again, this time in the banner atop the cover of this edition. Now, maybe I'm mellowing as the years advance, but in this instance I can understand that the editor is hoping to exploit the fan-base of The Six Million Dollar Man, bionic hero of the TV programme which Gran spoofs. The small-screen adventures of astronaut Steve Austin, titular technologically-enhanced star of the show, came to an end in the US as of March 1978 (I've been unable to source the UK broadcast dates but I would imagine 6MDM came to an end at roughly the same time in this country). Ed is no doubt hoping that any Austin fans who are undergoing withdrawal symptoms due to the absence of their slo-mo hero (video recorders being at the time as rare as sports trophies in Jogging Jeremy's display cabinet) will snap up the toothy funster's comic to sate their lust for anything vaguely bionic. Also on the cover, some bright spark has come up with a CHEEKY acronym. The Yeah! on the end is a bit desperate, so I award 6 out of 10 for effort. The cover pic shows Cheeky and Mechanic sharing a (slightly uncomfortable from a 21st century perspective) jalopy joke and we're off on another week of Corny Hilarity, Excellent Entertainment and Kids' Yocks. Yocks - you know, laughs. Alright - 7 out of 10? 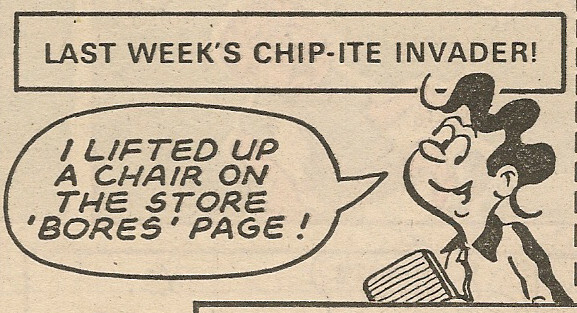 There are some words that are only ever encountered in comics. Spifflication is one (I prefer the double-f spelling), and Boilk (a sound uttered by comic characters in digestive distress) is another. On page 2, the latter emerges from Cheeky's alimentary canal as he contemplates Auntie Daisy's latest culinary concoction. 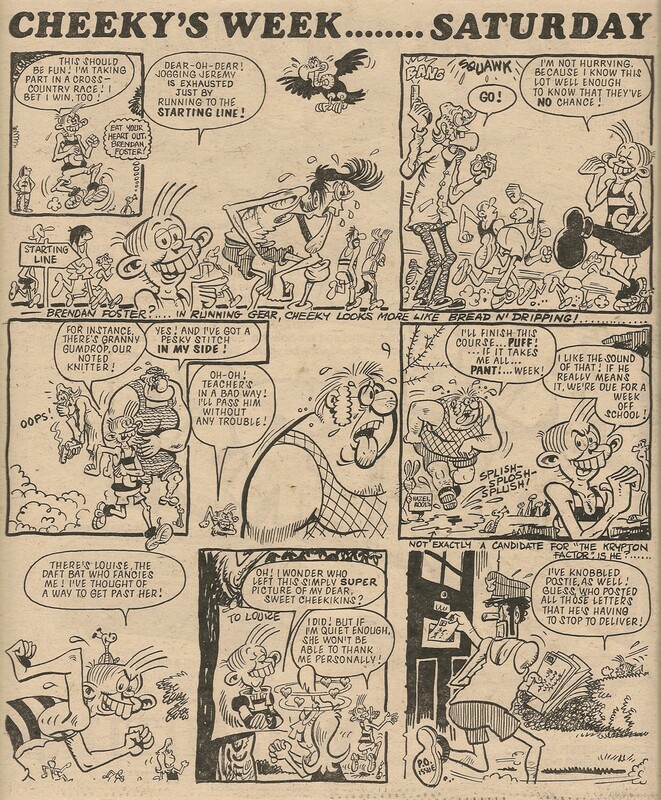 In addition to the gags with Cheeky's pals, there is, as always, fun to be had with the names of the newspapers our toothy pal delivers on his round – Sunday Souffle (Daisy), Sunday Sawdust (Mr Chips), Sunday Shy Boy (Hid Kid) and Sunday Snooty (Posh Claude). Sunday Sob is of course the name on Cheeky's newspaper-stuffed shoulder bag. 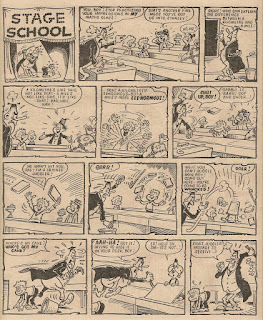 Stage School teacher has the customary difficulties while trying to educate his showbiz-obsessed pupils. The young impressionist gives his Oliver Hardy, fez-wearing comic Tommy Cooper, TV boffin Dr Magnus Pyke gesticulating frantically and trilby-topped sports presenter Eddie Waring. 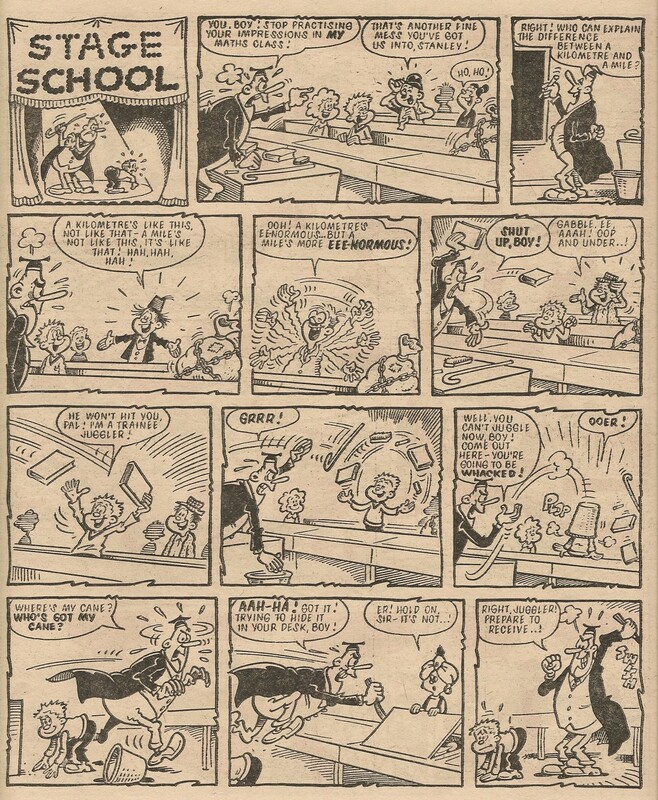 Teacher's intention of visiting violence upon his young charges (an Ofsted inquiry would result if he tried that behaviour today) is mercifully foiled by the kids' various talents, which ultimately see the egregious educator dispatched into the ether. No doubt he'll rematerialise in time to inflict further torment next week. 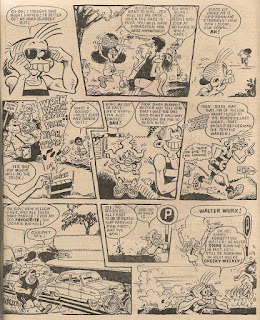 Unlike some other titles, Cheeky Weekly didn't regularly canvass readers on the relative popularity of its contents, so this rare appearance of a voting coupon makes me wonder whether IPC management, possibly having decided by this point that the toothy funster's comic would come to an end within 6 months, intended to use the responses to determine which of Cheeky's pals and strips would continue to feature after the impending merge into Whoopee. 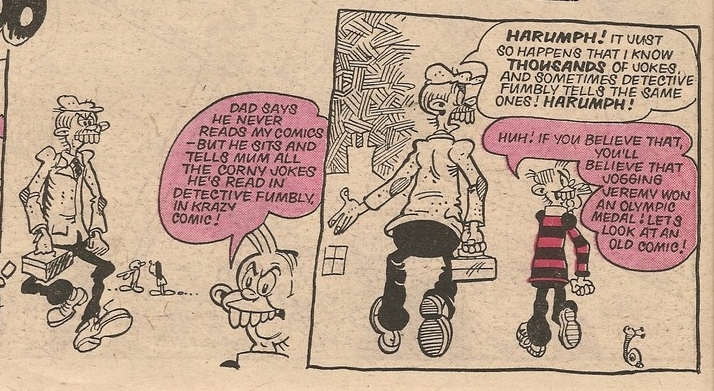 This would explain why the vote was restricted to funnies - the Mystery Boy reprints concluded in Cheeky Weekly dated 13 October 1979, about 4 months before the comic ceased publication. No new adventure story replaced it, and Whoopee had no adventure content as of the merge. Erk (panel 8). That's another comics-only word. 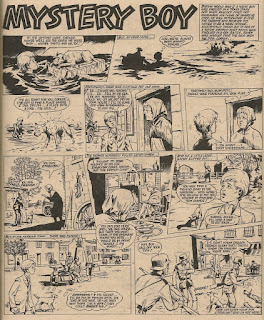 Having mentioned Cheeky Weekly's World War 2 amnesiac earlier, this episode sees things looking hairy as he and his canine companion unexpectedly find themselves in occupied France. 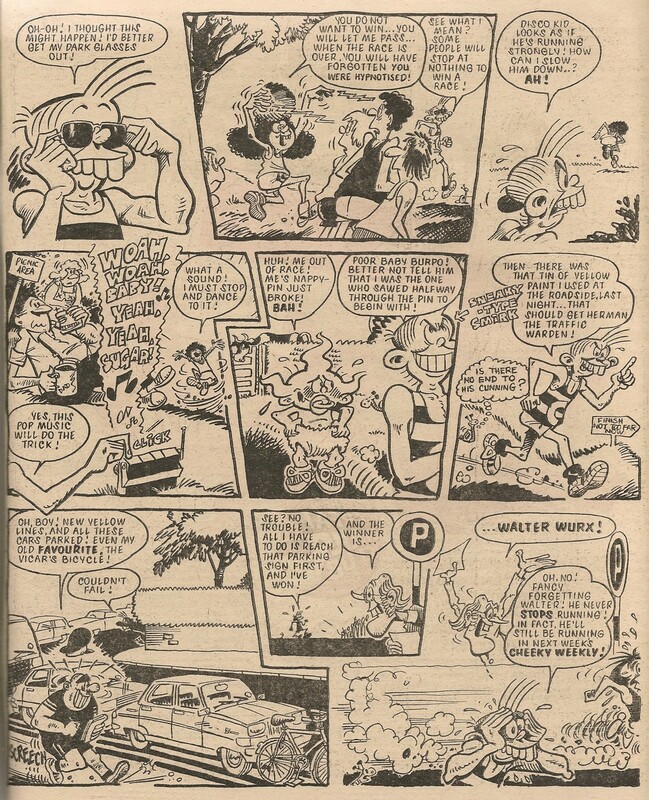 The funnies conclude with Cheeky and pals embarking on a cross-country run, during which our toothy chum employs some devious strategies in order to secure first place. I like the way Walter's running so fast in pursuit of a P that he's almost off the page. Snail of the Century has been dislodged from its usual back page location (and bumped from the comic) by an ad. 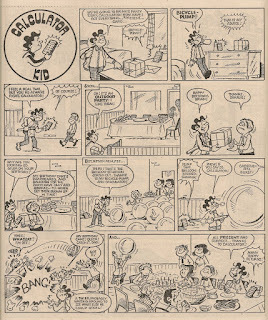 Frank McDiarmid draws all 8 Cheeky's Week elements in this issue (2 pages of Saturday). 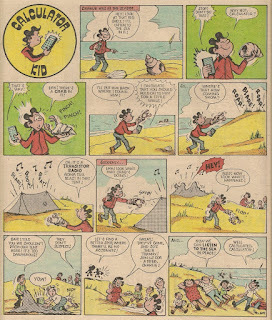 It's the first all-Frank Cheeky's Week for a month, and it's a corker. Pity we missed out on Snail of the Century. All art in this post is by the mighty Frank McDiarmid unless noted otherwise. Cheeky's Dad first appeared as a distant silhouette hefting a hod of bricks up a ladder in Krazy dated 23 October 1976. 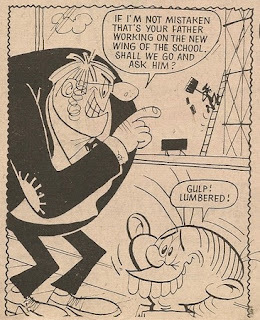 This bout of hard graft evidently didn't suit the toothy funster's similarly be-choppered pa, as he wasn't seen again until the first issue of Cheeky Weekly a year later. 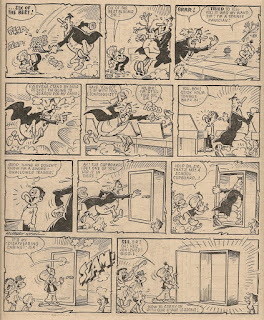 Cheeky's Dad's anti-comic sentiments prompted our hero to visit the attic wherein lay his father's clandestine collection of funny papers. 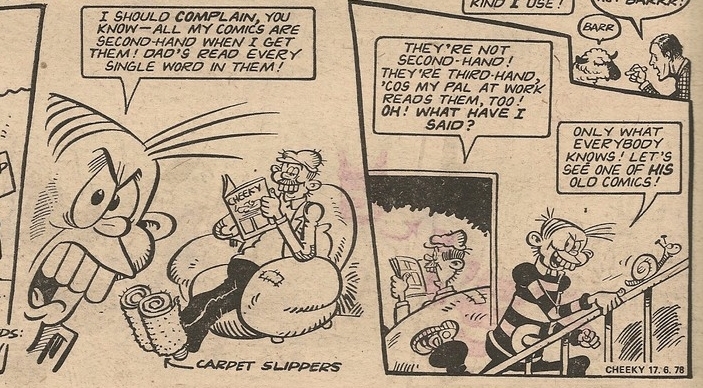 Our grinning pal then presented Cheeky Weekly readers with a page from among his old man's hoard of humour, in an un-named feature that I dubbed Old Comic. 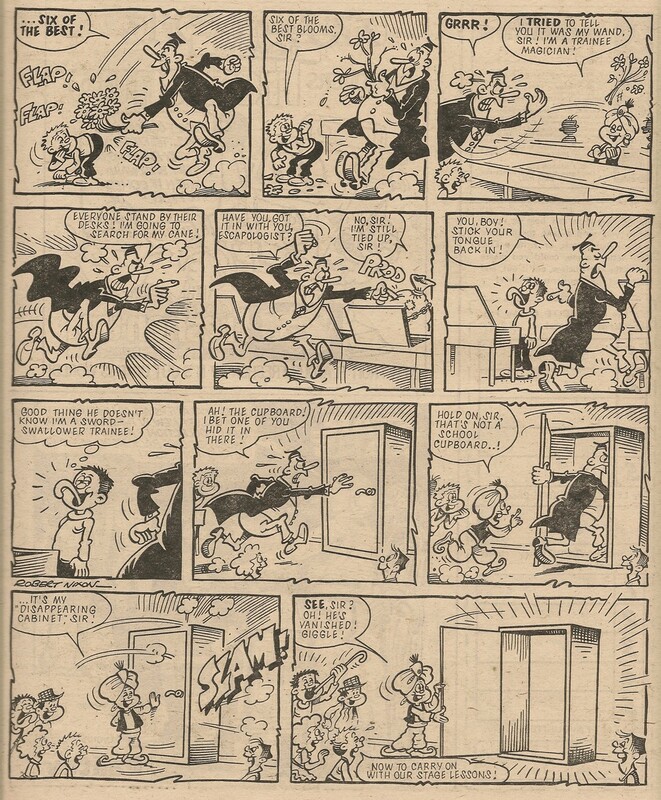 This Cheeky's-Dad-disparaging-comics-and-Cheeky-heading-to-the-attic sequence of events became the regular introduction to Old Comic. 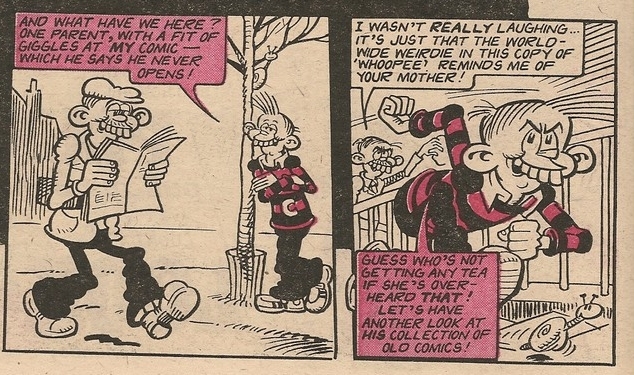 Despite his declared antipathy to comics, it was clear Cheeky senior wasn't averse to immersing himself in the funny papers he ostensibly bought for his son. Dad would sometimes apprehend his offspring in the attic, requiring some quick-thinking on the part of our toothy chum. As can be seen above, aspiring artist Doodle Doug manipulated the Cheeky vs Dad comics vendetta to his advantage. The first of Dad's cover appearances occurred on the front of Cheeky Weekly dated 03 December 1977 and scant weeks later he was again drafted into front cover gag duty for the 14 January 1978 edition. Dad developed a secondary role as of that 14 January 1978 comic, whereby each Sunday evening he and Mum would be the victims of Cheeky's latest scheme to circumvent the 'early to bed ready for school tomorrow' house rule in order to watch the latest TV episode of 6 Million Dollar Gran. However, when Mum was out, it became evident that Dad was also a secret Gran fan, as he joined Cheeky in watching the adventures of the synthetic senior citizen. 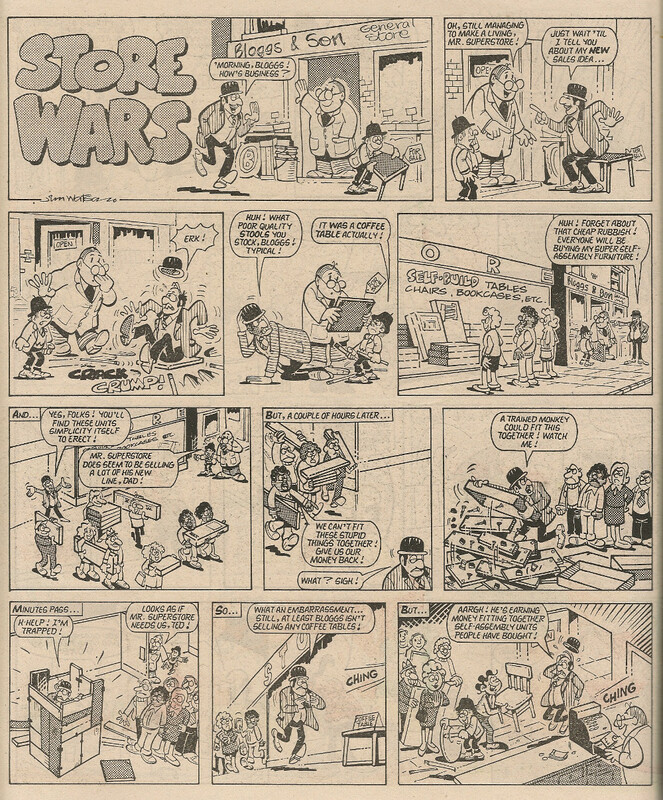 The 24 June 1978 issue saw Dad make another cover appearance, yet again the victim of one of his son's unlimited supply of gags, and on the cover of the comic dated 15 July 1978, the joke really was (well, almost) corny. During the 1978 summer holidays, Dad announced that the family were off on a surprise canal barge holiday, and he consequently appeared on 4 separate days during Cheeky's week, sporting a rather fetching nautical look in which a peaked cap replaced the flat variety he customarily wore. 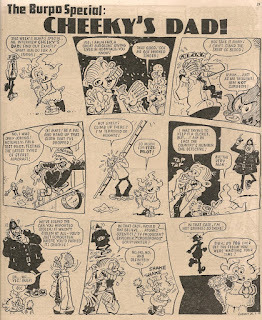 Cheeky Weekly's 01 July 1978 issue was a significant one for the head of the Cheeky household, as it was the last to include the usual introduction to the Old Comic feature. 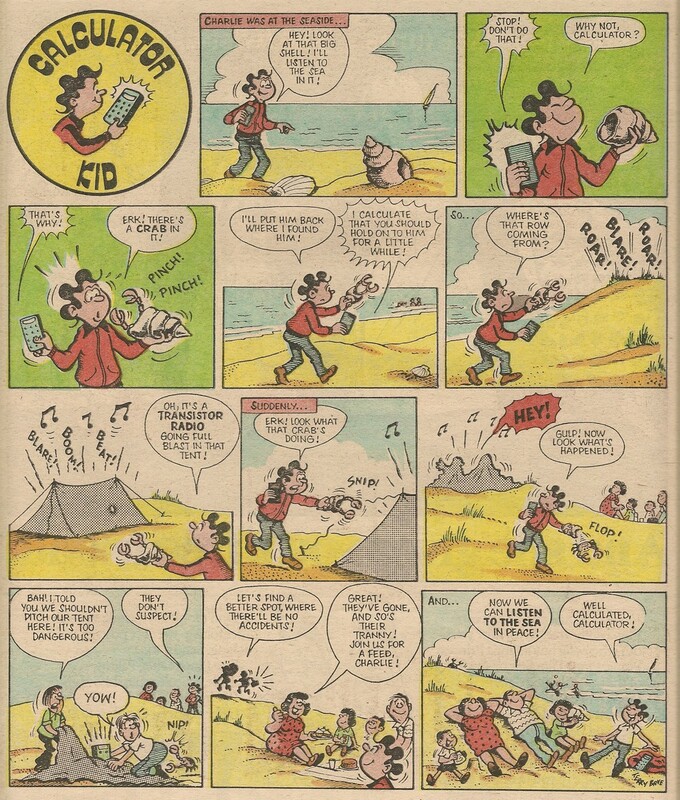 Old Comic was absent from Cheeky Weekly from 08 July to 19 August 1978. 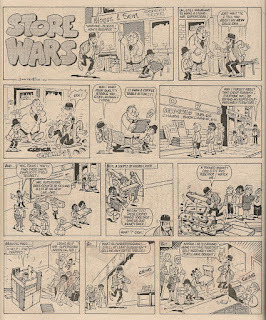 On its return for a final time in the 26 August 1978 edition, the Old Comic was without its traditional intro. 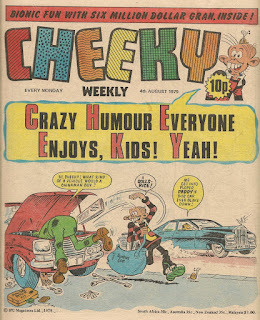 Dad's (and Mum's) customary Sunday evening appearances were brought to an end when the Sunday evening feature was dropped from Cheeky's Week as of 30 September 1978. 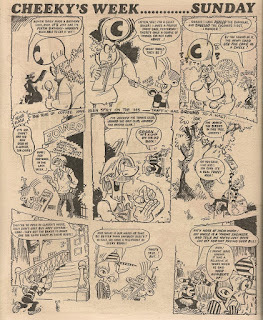 However, as Cheeky explained in that same issue, “They're putting [6 Million Dollar Gran] on in the middle of the day now!”, so Cheeky's parents continued to be on view as the toothy funster partook of Gran's mid-day screenings (although the shunt forward in transmission times meant there was no further need for subterfuge on Cheeky's part to secure a place in front of the TV). Cheeky's pater was clearly getting a taste for the front cover, his toothy mug appearing there again on the 13 January 1979 comic as the Cheeky clan prepared to welcome the new year. During the party, Dad's deft about-turn concerning his son's bedtime prevented the premature conclusion of festivities. He was rewarded in a way that upset Mum – for the full story see here. 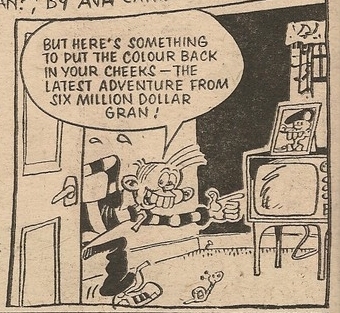 Cheeky senior's real moment in the spotlight came in 20 January 1979's Burpo Special. But even the investigative skills of Burpo couldn't prise the truth from devious Dad, although erstwhile Krazy readers would have been aware of the true occupation of Cheeky's old man. 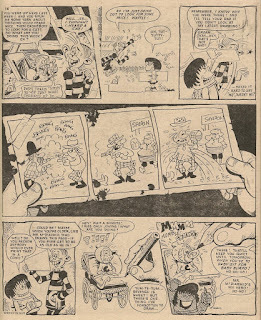 Cheeky Weekly dated 18 August 1979 saw the first of Dad's eight cameo appearances in the Snail of the Century strip, which centred on the back garden adventures of Cheeky's slithering sidekick, but always started and ended with the mirthful mollusc observing events chez Cheeky. 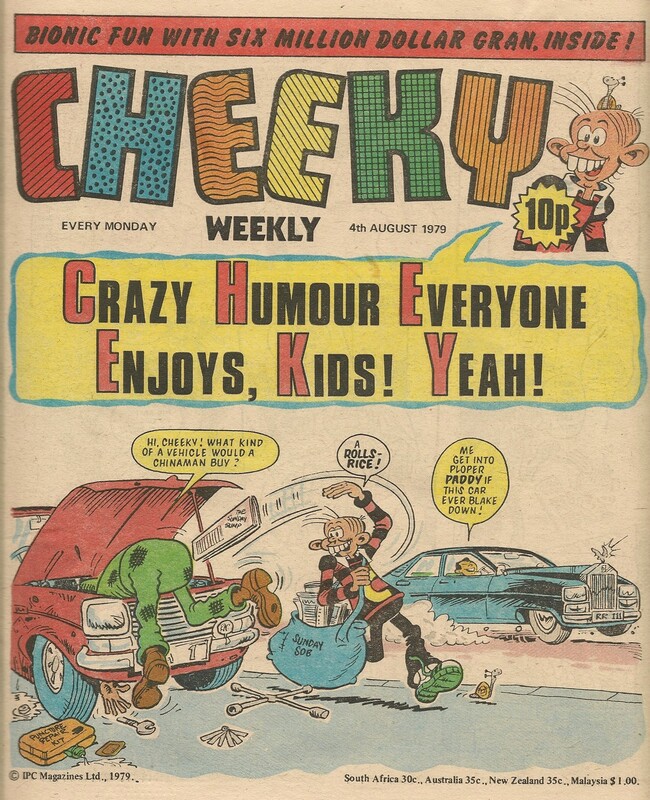 As Cheeky Weekly entered its final months, appearances by Cheeky's Dad became less frequent. However, he did turn up on 4 pages in the 29 December 1979 Christmas issue (3 Cheeky's Week pages as Mum threw Cheeky and Dad out of the house while she prepared a celebratory lunch for the toothy funster and his pals, and a Snail of the Century). The following week our grinning chum's pater featured on 2 pages (once for the Cheeky household's annual new year bash, then again in Snail of the Century). 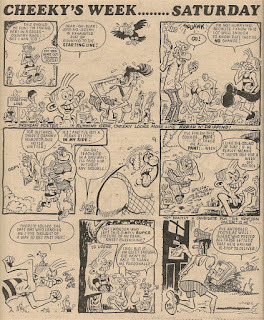 The final time Cheeky's Dad appeared in the comic was a Snail of the Century cameo in the concluding issue, dated 02 February 1980. This brought to 73 the total editions in which Dad appeared. Don't worry, pals - this blog isn't about to merge into another. 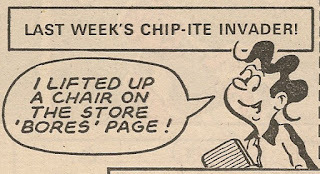 I just wanted to point you to a new entrant into the world of comic blogging. Any blog that starts off with a pic of Cheeky is alright with me!